Hanzo's Dojo is a non-standard 5x3 slot game with a pretty big potential of X3.000. It is optimized for playing from all devices. Its producer is famous Yggdrasil Gaming company, which never loses the reputation of a qualitative developer. Hanzo’s Dojo has a never dying Japanese design, with pictures, music, and background referring to Medieval Japan. Regular symbols represent different elements of nature. Special symbols are portraits of characters who occupy the dojo. Plus, there is a feature of these slots: an additional row which determines current bonuses. It has got own symbols. The combination of music and appearance creates a unique oriental spirit. It will not let you leave the game for many hours. Why is this game so beloved by Canadians? The answer is simple: there are so many ways to win here. 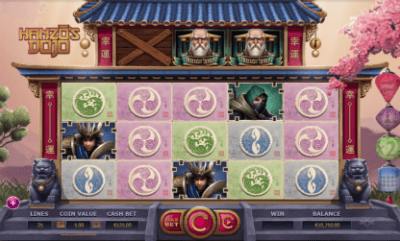 The extra rooftop slot gives three different bonuses: Hanzo spins, Free Spins and Wild. Wild drops down on the lane below, Hanzo gives special Hanzo spins. These spins imply a giant 3x3 symbol covering the fourth and the fifth rows. These symbols raise variability and chances to improve award multipliers. Different boosters can be obtained with a Free Spins modification. They appear in a special regime with the same name. In it a rooftop row can show only blank or free spin symbols. Three center rows are able to spin giant 3x3 symbols. A player saves the bet with which he has activated the Free Spins mode. The mode can give various boosters and additional free spins. Other boosters include various multipliers, ability to get reward through two ways and ability to turn the fifth row into Wild symbols. At first glance, everything seems to be too complicated. However, many Canadians claim that it is real fun. Various boosters make the game unpredictable and raise chances to win big money. All in all, this medium volatile slot game has become a trusted mean of entertainment in Canada and other countries.